Shortly after crossing midfield with about eight minutes left in the third quarter and WSU trailing 19-13, the Cougars rolled out their variation of the classic “swinging gate” formation. Not once, but twice. PULLMAN – Washington State coaches have put a lot on Kyle Sweet’s plate throughout his career, so it shouldn’t be a surprise coach Mike Leach entrusted his slot receiver-slash-punt returner-slash-rugby punting specialist to spearhead a sequence of trick plays that had television viewers frantically pressing rewind on their remote controls during the third quarter of Saturday’s opener at Wyoming. Shortly after crossing midfield with about eight minutes left in the period and WSU trailing 19-13, the Cougars rolled out their variation of the classic “swinging gate” formation. Not once, but twice. With all 11 offensive players jammed between the left hash mark and left sideline, Sweet, the center, positioned himself over the hash and performed a one-handed snap, diagonally, toward quarterback Gardner Minshew. Running back James Williams cut in front to catch the direct snap, then followed a cluster of blockers for a 5-yard gain. The Cougars executed it again on the next play, netting 4 more yards. The concept that produced the 9 most interesting yards of Saturday’s 41-19 WSU victory was not devised during one of Leach’s long strolls to work – often used as brainstorm sessions – or conceived while the coach was scribbling out his thoughts late at night in the Cougar Football Complex. 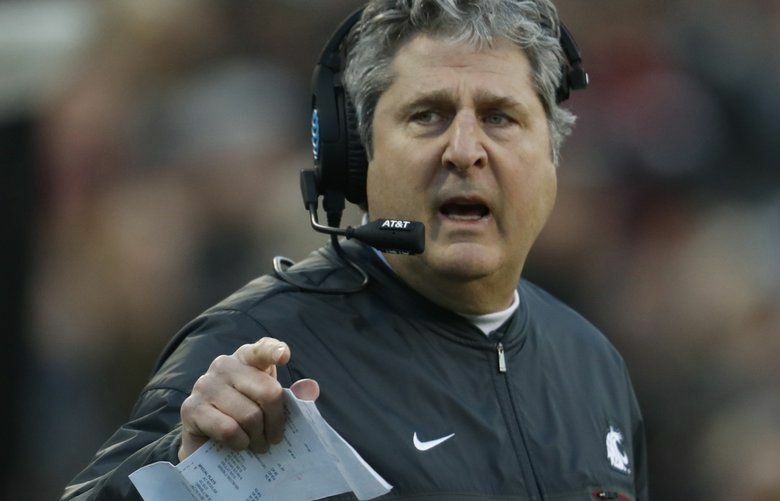 The seventh-year WSU coach described that as an homage to “a friend of mine,” but anyone who followed along with the summer Twitter feud between Leach and Dan Wolken knows it’s a subtle jab at the USA Today columnist. Wolken was critical of Leach when the coach tweeted out a doctored video of a Barack Obama speech in June. The coach reiterated that opinion Monday in his weekly news conference. Leach, who co-authored the Air Raid offense with Hal Mumme at Iowa Wesleyan, said it wasn’t the first time he’s solicited advice from a non-football mind. When he was an assistant coach at NCAA Division III Valdosta State, Leach said he occasionally received pointers from a building janitor, who made some particularly astute observations about the body language and footwork of Leach’s offensive linemen.